"Picture of Grandma and Grandpa. He is looking at something. Notice the shadow of me in the picture. Taken in the same place as others." Louis, Ben, Leroy. "Tin Soldiers. Notice the pants on Pa. You can take a drink of well water if you wish but be sure to put the cup back. This picture taken somewhere between the kitchen and the smokehouse." "Our oldest daughter, Anna was born at Rockbridge, Illinois, November 21, 1875; she was a strong healthy girl and being musically inclined, she helped to make home blessed. At the age of 22 she was married to Louis Oehler, a C&A engineer; they live in Chicago and are doing well; they have four children, two boys and two girls. Louvilla, the oldest at age 11 years, the Lord transplanted her to his heavenly kingdom. Florence, the second girl, died in infancy. Philip and Ben are two bright boys and help make the home blessed." 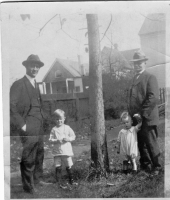 Mabel, Jim Robinson, and James Leo Robinson. Jim had a third child Emmanuel. 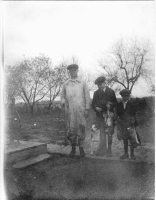 Picture below are Chester A. Jacoby, Chester A. Jacoby Jr., Charles Philip Jacoby, C. C. Robinson.